Florida landscapes are often the focus of both local artists and artists from around the country, and it’s easy to see why. Vibrant colors, lush wetlands, and exotic wildlife can be found just outside our doors. Whether you live here in Florida or just like to visit on vacation, there’s plenty of beautiful wildlife to see all year long. Throughout the years, countless artists have captured Florida’s beauty using paint, drawings, photography, and more. These artists see our landscape as something unique and worth capturing, so we wanted to highlight some local artists and showcase their work. Arguably one of the most famous Florida landscape artists to date, Carlton Ward is a conservation photographer that has had the opportunity to photograph landscapes around the world. He currently focuses on Florida’s wildlife and landscapes and hopes that his photography will inspire conservation efforts from locals and tourists alike. During his early photography years, Carlton had multiple internships that allowed him to fine-tune his photography technique. His photos can be purchased online or at the Carlton Ward Gallery in Tampa, FL. Many of his photographs have been featured in magazines such as Smithsonian and National Geographic. Using high-end oil paints and printing techniques, Keith Martin Johns captures the beauty of Florida’s landscape and wildlife. For over three decades, he has been painting the beauty of Florida, and as a Florida native, always had a dream to capture that beauty through art. Using a wide range of materials and painting techniques, he puts his own personal vision on how he sees Florida’s landscape, which is what makes his art so appealing. Using both realistic and imaginative imagery, Johns captures the true essence of Florida’s wildlife. You can purchase original paintings as well as prints on his website and in galleries throughout Florida. Focusing on oil paints, Charles Rowe is another artist that has been featured in multiple galleries in the area for his beautiful paintings of Florida’s landscapes and wildlife. Using a more traditional painting method, Rowe showcases Florida’s hidden elegance by capturing the vibrancy of the landscape and wildlife on a large-format scale. Prints, as well as originals, are available online and in local galleries. He has been featured in galleries across the country and is currently on display in Dunedin. Taking a more colorful and imaginative approach to painting, Linda Blondheim’s art is full of bright color and fun subjects. Blondheim focuses on Florida’s rural landscape, and many of her paintings involve farm themes and elements. Most Florida landscape artists focus on the coast or the wetlands, but Blondheim highlights the hidden beauty of rural Florida. Blondheim uses non-traditional colors and styles to show a unique side of Florida that not many people get to see. She owns her own art studio just outside of Gainesville, and she also sells her paintings online. 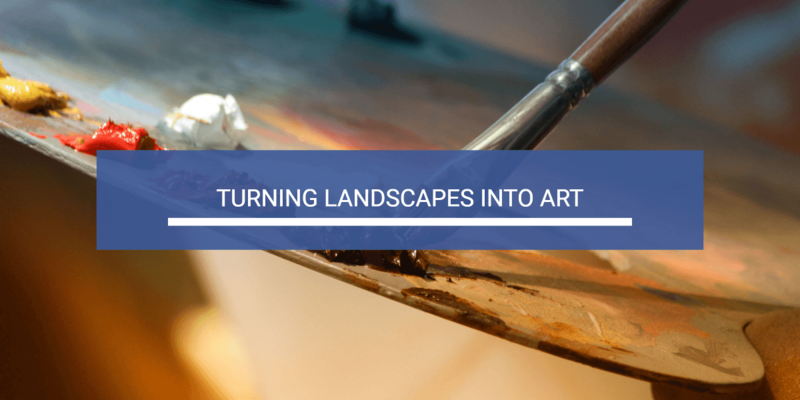 If you’re not skilled with a camera and aren’t confident in your painting skills, there are still plenty of ways that you can create your own landscape art. In fact, your own landscape can be the art itself. A simple redesign of your outdoor space or a complete renovation can transform your home or business into a stunning work of art.